Muralist and new mom Lauren Pallotta Stumberg walked past The Edge construction site every day while she and her son strolled through their Old Fourth Ward neighborhood. 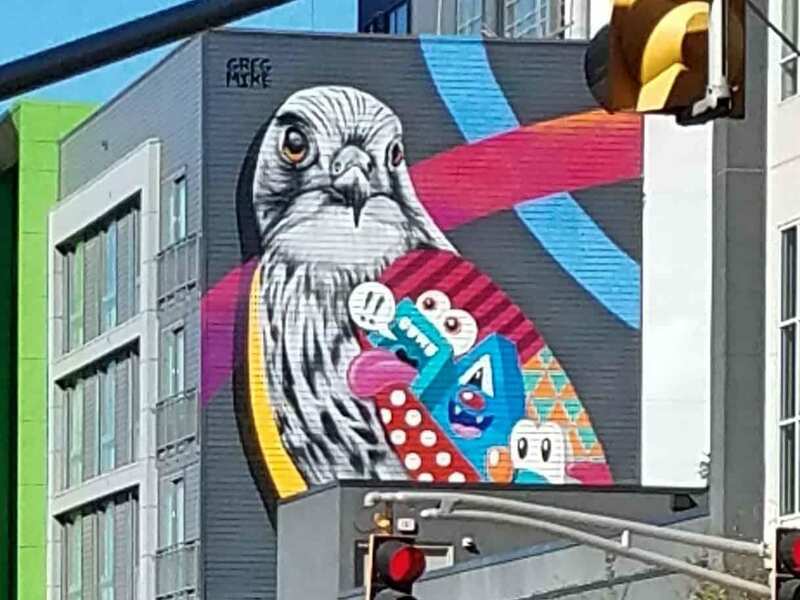 She eventually gathered the courage to cold call the apartment complex’s property manager and propose a mural for the nine-story wall facing Edgewood Avenue. In the male-centric world of murals, this was a Girl Power project. The Edge team was predominantly female, from the muralists to their assistants and the lead construction worker. “The feeling of empowerment having an all-female leadership team was timely and something of which to be proud,” says Melania Armenta, marketing manager for the building, owned by North America Properties. It’s titled Persephone Rising and depicts the Greek goddess of spring growth surrounded by botanical imagery. Stumberg was the curator and lead artist. 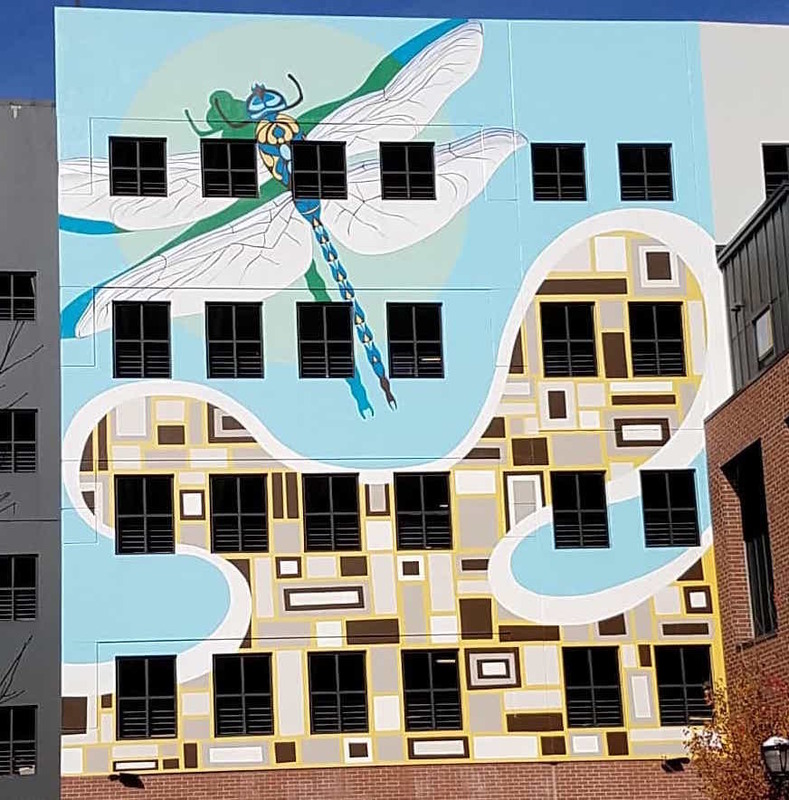 She recruited muralists Lela Brunet, Molly Rose Freeman and Laura Vela because they “value collaboration over competition and mix pattern with both realism and abstract concepts.” This is the largest project on which any of them has ever worked. Because she represents Everywoman — strong, soft and in between, say the artists. Also because she represents abundance and female strength. The mural shows her rising from the underworld, and when she comes to Earth, it’s spring and summer and the harvest. When she returns to the underworld, everything is dark and cold. 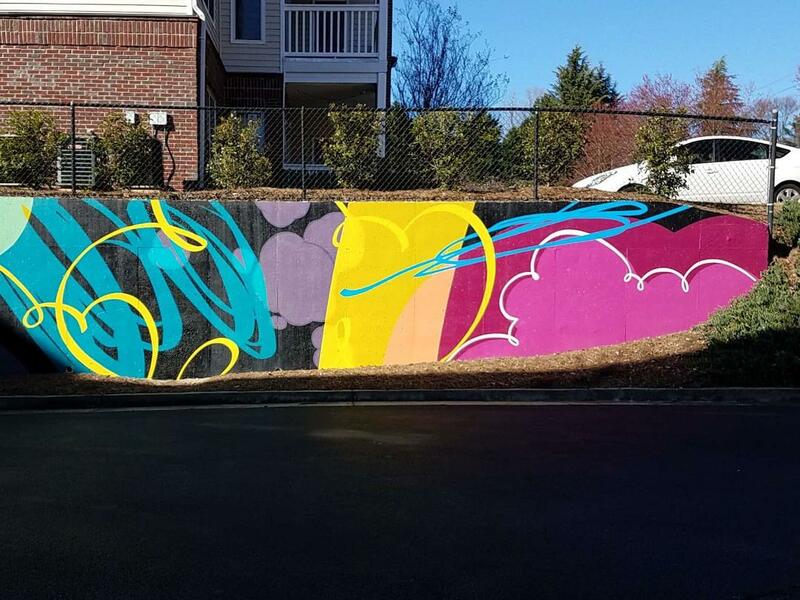 The Edge mural is at 670 DeKalb Ave. NE on the Atlanta BeltLine in the Old Fourth Ward. The best view is from the bridge on Edgewood Avenue. Stumberg got the phone call in late May 2018, and work on the mural began in November. The team finished on December 22. See more on the Old Fourth Ward section of the Atlanta Street Art Map and its Atlanta BeltLine Eastside Trail Walking Tour. 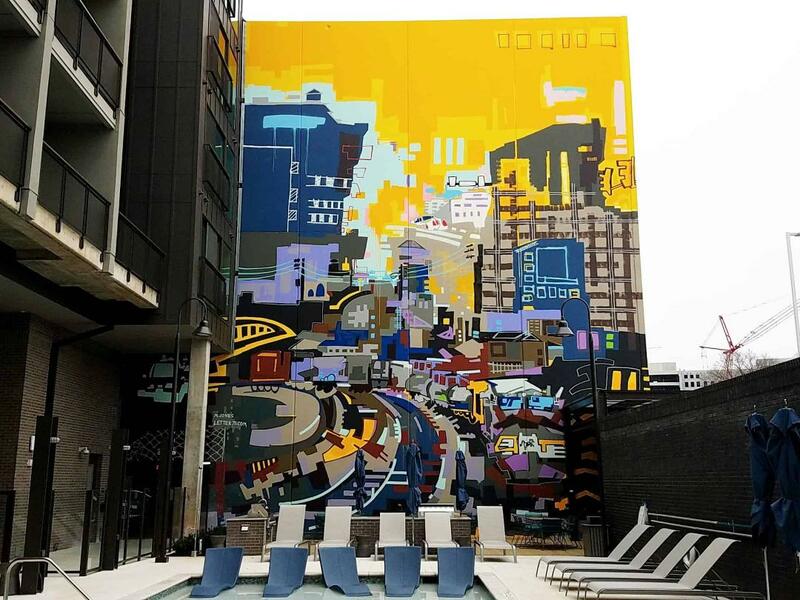 The Edge is one of at least six Atlanta apartment complexes digging the mural vibe. 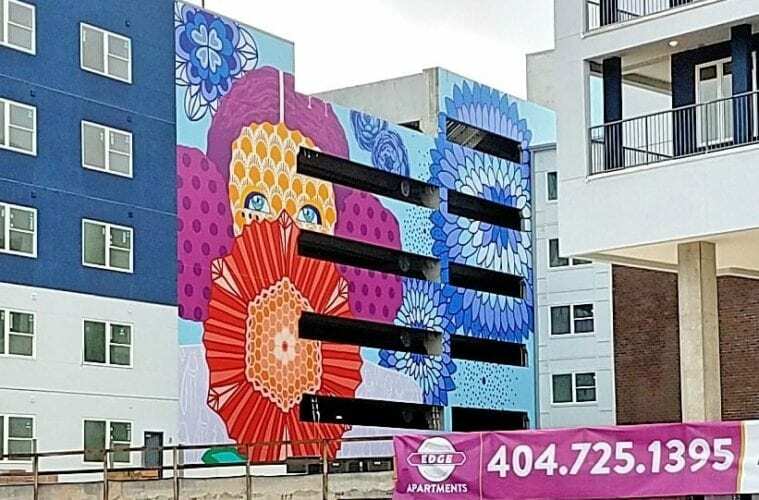 You’ll see murals at Icon Midtown on 14th Street (artist Alex Brewer, aka Hense); Modera Midtown on Eighth Street (artist Greg Mike); Highland View on Ponce de Leon Place (artist Ryan Coleman); The Local on 14th (artists Andrew Spear and Charles Richardson); and Broadstone Yards on Howell Mill Road (artist Michael Jones, aka letter75). This column is a collaboration between ARTS ATL and Art Rudick’s Atlanta Street Art Map. We’d like to hear from you, too. 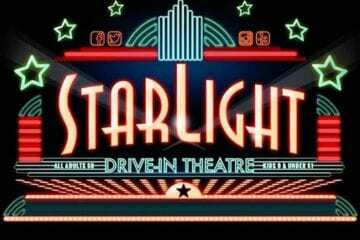 Make comments and suggest murals, artists or neighborhoods we should spotlight. Please e-mail kathy@artsatl.org.